Dubai, UAE, April 3, 2018: Alice Scott is a leading British stationery and gift brand, channeling black and white style since it's launch in 2013. Their design began with simple idea, but the aesthetics are also bold and well made. The monochrome illustrations, patterns and contemporary editorial have become Alice Scott's signature – and the brand offers a wide range of cards, luxury gift-wraps, bags, stationary and most recently, ceramics. Alice Scott's Spring/Summer 18' collection follows the same monochrome vibes with a touch of colour and print here and there. '...keep your enemies closer' with this cheeky A6 notebook. Perfect for 'taking names' (so to speak)...or maybe just some notes and your shopping list. Your call! Beautifully bound this B5 notebook contains 160 lined pages with a fun tropical inspired monochrome print. Enhance your stationery collection with this leatherette covered notebook from Alice Scott. Featuring multiple list pads and fun sticky notes, it also includes a handy Alice Scott branded pen! Keeping organised never looked so good. The ultimate desk accessory - this wiro chunky A4 notebook features gold foil detailing and lined pages. This handy desk organiser, contains three patterned pencils, gold and black paper clips, roll of washi tape, sticky notes, pebble shaped eraser, gold and black bulldog clips and a pencil sharpener. Cheeky phrases, graphic prints and playful sophistication are synonymous with the Alice Scott brand. Note To Self pen set - three pens in three different designs - list making has never been so fun! You'll always be able to find your way home in style, with this fabulous leatherette keyring from Alice Scott, complete with gold foil detailing. Perfect for the stylish jetsetter, the Luggage Tag and Passport Cover are both beautiful and practical. Presented in a monochrome gift box, the matching tag and passport cover are crafted from luxurious leatherette. 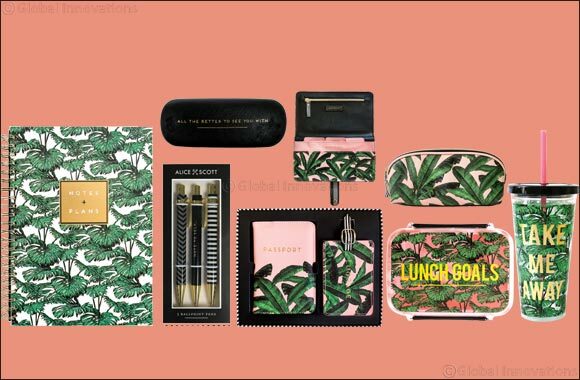 Strikingly decorated in pale pink with tropical green palm leaves, the essential travel accessories are completed with gold foil accents. Travel in style with this gorgeous leatherette travel wallet. Comes with handy gold foil tabs for easy organization. Handy for keeping your make up essentials close by. This black and gold foil make up bag also has a gorgeous strippy liner! Handy for keeping all your toiletry essentials on the go! Beautifully printed faux leather materially with fun stripy liner! A water bottle that motivates you to work your 'sass' off at the gym! Constructed from insulated acrylic and boasting a scew-on cap, this delightful 'Hot Stuff' travel mug from Alice Scott is sure to keep your coffee warm in style! Super fun sippy cup with gold foil text and palm design. This 568ml fully insulated cup makes it the perfect accessory for on the go. Nom nom nom! Never run out of storage for your treats with these delightful snack pots from Alice Scott. Inspired by Russian nesting dolls, this set of 3 storage containers sit inside one another. Containing a large pot for major noms, a medium pot for minor noms and a smaller pot for smaller noms, they're ideal for storing sweets, biscuits and home-baked snacks. Lunch time just got a lot more exciting thanks to this fabulous lunch box from Alice Scott. Safe for use in dishwashers and microwaves, it features clip fastening to ensure your food stays fresh all day long. Emblazoned with a humorous slogan, it's ideal for picnics, days out or for taking your lunch into the office.